All of our events are conference-oriented educational events. Our conference content is carefully designed by us to ensure the focus is on what businesses need to know to successfully plan and implement digital experience, content management and technology solutions and practices. Conference content is not based on the latest buzzword, specific product releases, the need to sell analyst reports, or a need to supplement an exhibit floor. Our conferences are designed to foster interaction between all stakeholders, with the ultimate goal of increasing the successful implementation and deployment of content technologies to improve the digital experiences of customers, employees, and partners. Because we are strictly neutral with regard to vendors, analysts, press, enterprises, and consultants, we have been able to maintain a constant dialog with each group, all of whom are our customers, all of whom we have learned from, and all of whom we encourage to participate in our events as speakers, attendees, and exhibitors. 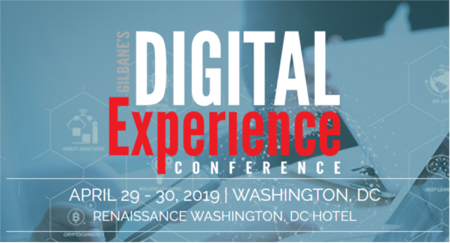 Review the conference description and topics for our next event: main conference April 29 – April 30, 2019, post-conference workshops May 1, at the Renaissance Washington, DC Hotel, Washington, DC. Use the proposal submission form to submit a proposal by October 22, 2018 that is relevant to the topics described. Please include a 100-200 word abstract, 200 word speaker bio, and speaker contact information. Pay attention to the deadline. We are happy to accept proposals anytime, even before we issue a call for papers, or after the deadline has passed. Be sure to identify which event you are submitting a proposal for. We do not accept sales pitches or marketing presentations. PR firms should only forward proposals submitted by the actual presenter, and include their contact details. If you will be coordinating a colleague’s speaker’s participation, provide all your contact information in addition to that of the speakers’. You will be contacted if your proposal is accepted, or is being considered. Feel free to email us with inquiries about your proposal, however PR firms calling four times a day are not helping their client. If you have questions not answered on this page, please email: speaking@gilbane.com. Our speakers are active stakeholders in some part of our industry. The biggest benefit in presenting at our conferences is to share experiences and network with your peers, and to interact with the most influential community of digital experience, content management, digital marketing, and technology experts in the industry. Because of the high quality of our speakers, we promote our speakers and their backgrounds on our website and social channels. Speakers receive a complimentary full conference pass. Speakers may also request a free conference session pass for a colleague. We do not provide speaker honorariums or reimburse for expenses. Provide your presentation to us in electronic form for distribution to the conference attendees before the conference begins. Most presentations will be part of a conference session covering the same topic. Times for presentations can range from 15-45 minutes, but the majority are 35-45 minutes followed by 5-10 minutes of Q&A. Our Post-conference Workshops are 3 hours. If your presentation is supposed to be 20 minutes long, getting through 45 slides is almost impossible. Also remember that slides with lots of builds take more time than a slide with no builds. A good rule of thumb for most people is 1 slide for every 3 minutes of presentation. The best thing to do is time yourself in advance! Make sure your slides are readable. In general, nothing below 18pt type is going to be readable by anyone not in the first few rows – 24pt and up is usually safe. Speaker substitutions are generally not allowed. Our speakers are chosen for their knowledge and communication capabilities, not because of who they work for. If for some reason you need to cancel, please let us know ASAP, and provide replacement recommendations in case we do not already have a speaker on the waiting list for that particular topic. Although most of our speakers are businesses presenting case studies, analysts providing market insight, or experienced consultants and technologists providing “how to” guidance, we welcome speakers from the vendor community to contribute non-marketing presentations. Vendor speakers often have the most detailed knowledge about new technologies and use-cases and are valuable contributors. Our sponsors and exhibitors are a critical part of our events and high-value interactive environments at our events would not be possible without them. While we are pleased when we can include a sponsor or exhibitor representative as a conference speaker, a speaking slot is not guaranteed. All accepted presentations are based on the merit of the proposal, the individual speaker, the relevance of the topic, and a speaking slot being available. It is always a good idea to submit proposals well in advance of the deadline. We will still accept proposals after that date just in case any relevant openings become available. The deadline for submitting proposals for the next Gilbane Conference is October 22, 2018. We always receive many more excellent proposals than we can fit into our program. Please do not be discouraged if you are not selected. We do multiple events, and may be able to fit your presentation into another conference.